This book is the product of Donald Akenson's decades of research and writing on Irish social history and its relationship to the Irish diaspora - it is also the product of a lifetime of trying to figure out where Swedish-America actually came from, and why. These two matters, Akenson shows, are intimately related. Ireland and Sweden each provide a tight case study of a larger phenomenon, one that, for better or worse, shaped the modern world: the Great European Diaspora of the "true" nineteenth century. 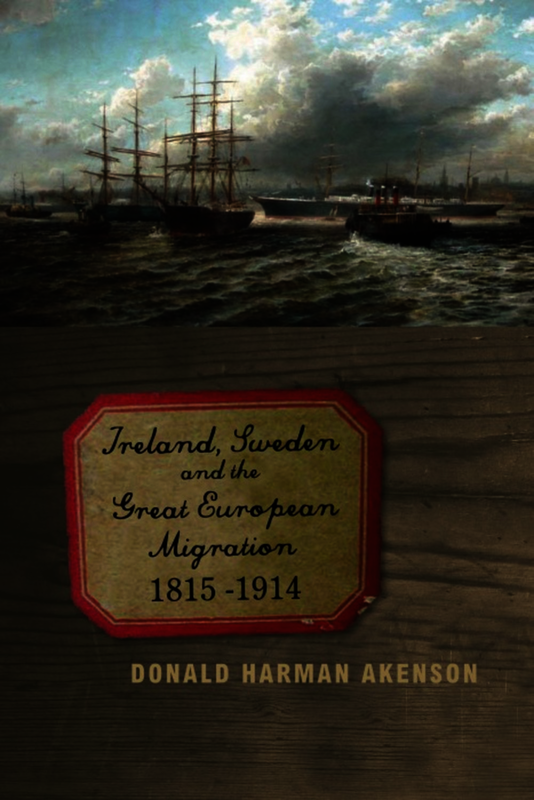 Akenson's book parts company with the great bulk of recent emigration research by employing sharp transnational comparisons and by situating the two case studies in the larger context of the Great European Migration and of what determines the physics of a diaspora: no small matter, as the concept of diaspora has become central to twenty-first-century transnational studies. He argues (against the increasing refusal of mainstream historians to use empirical databases) that the history community still has a lot to learn from economic historians; and, simultaneously, that (despite the self-confidence of their proponents) narrow, economically based explanations of the Great European Migration leave out many of the most important aspects of the whole complex transaction. Akenson believes that culture and economic matters both count, and that leaving either one on the margins of explanation yields no valid explanation at all. This monumental study clearly will have a huge impact in the field. Typically of Akenson, an original thinker of the first order, it debunks many myths, half-truths, and lazy assumptions on the part of historians. However, this isn't simply a book which debunks. It isn't a tract or a treatise. Its central contribution is in offering one of the best (perhaps the very best) comparative history of European emigration. Akenson has presented us with an insightful and engaging book whose greatest weakness is its miniscule typeface; the fact that I was nonetheless willing to pore over its every page is testimony enough to the quality of its content. Ireland, Sweden and the Great European Migration is a vital and thought-provoking read, not only for the scholar interested in Ireland’s and Sweden’s history and migration and European history and migration more generally, but also comparative endeavours. D. H. Akenson is widely regarded as the most distinguished scholar of the history of the Irish diaspora, and justifiably so, given his enormous range of interests and his impressive list of books and scholarly articles. What characterises the Akenson approach is an engaging style of writing, a deep and seeming insatiable curiosity about the structures of the past—and how we should understand the complexities of this past on its own terms—and a lightness of touch when it comes to statistics. All these elements are evident in this excellent book…The true measure of the quality of a work of scholarship like this one is to get people to think, and this Akenson does this with admirable skill and cleverness. ...a remarkable text that weaves statistical analysis with incisive historiographical commentary to produce a lively argument. Highly recommended. ...a splendid work that will well reward the attention of anyone interested in the practice of history. This is a masterful economic-demographic study by a master of that approach. As such, emigrant voices usually count for little, for as has been argued, statistics do not bleed—neither do they tell the claims of a steamship agent, cheer the arrival of an “America letter,” or breathe with both sadness and hope as the ship turns from the coast and the beloved but wretched homeland fades in the distance. Donald Harman Akenson is currently Douglas Professor of Canadian and Colonial History at Queen’s University, Kingston, Ontario. He was also beamish Research Professor of Migration Studies at the University of Liverpool from 1997-2004 and Honorary Professor at the Research Institute of Irish and Scottish Studies at the University of Aberdeen. Akenson has received six honorary doctorates for his scholarly work.